Aurora is a warm, mailart-friendly Virtual Land. It has its own currency, the Zerovian ik, a delightful national dish, meloncake, and a newly rediscovered mythology. 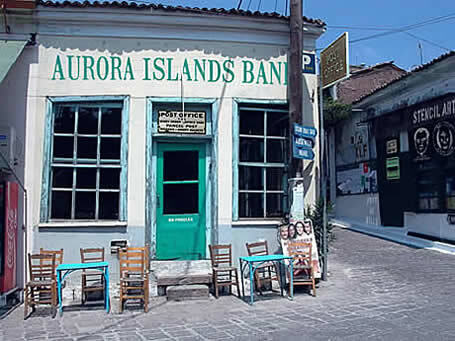 The sailors who first mapped the southern oceans searched for a group of islands they knew as 'Aurora'. Legends about the elusive archipelago abounded - tales of fantastic mineral wealth, of exotic animal and plant life, and of a people who despite their physical isolation, created astounding artifacts in celebration of the Congress of the Islands. For centuries, whilst the myths persisted, the islands themselves remained undiscovered. Then, in 2001, intense seismic activity around the Island of Zerovia resulted in the eruption of Mount Obsolete, and the emergency evacuation of President Gazundry Arbuthnetssen, his citizens and artisans. And amidst all the chaos and calamity, thrust upwards by a restless earth, appeared a chain of 'new' islands. 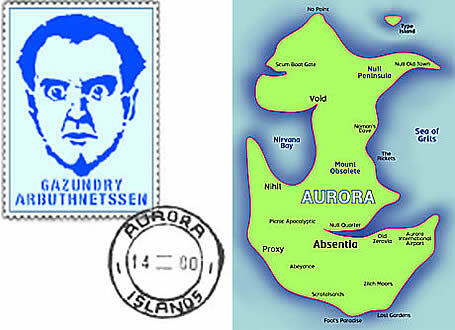 Furthermore, astonishing archeological evidence of an early, yet advanced, lost civilization was being raised above the waves and exposed, and so convinced was President Arbuthnetssen that the world was witnessing the rebirth of Aurora, that a Council of Redesignation decreed that from 2003 his country should officially be known as the Aurora Islands. In 2005, the Islands were deemed ideally suited to offer safe habitat to the genetically re-engineered Dodo. 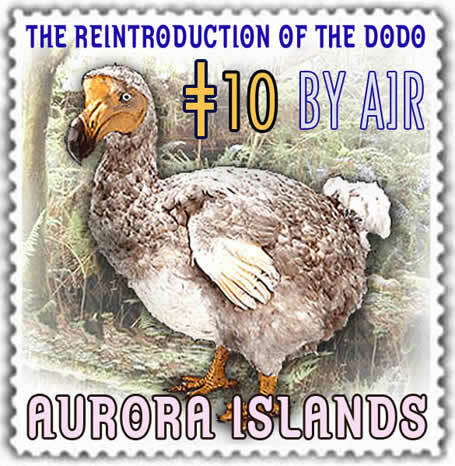 With Aurora itself being recently reborn, scientists at the University of Absentia recognised the poetic symbolism and mounted a successful bid to host the release of the Dodo on the safe sanctuary of Type Island where the bird has flourished.